I read The Hitchhiker’s Guide to the Galaxy nearly 30 years ago and don’t remember finding it all that funny. I also never cared for Monty Python. Maybe it’s the British humor I don’t get, but Fawlty Towers cracks me up, no matter how many times I see each episode. Humor is such a personal thing, and sometimes I just don’t see humor in things others find funny. And other times I laugh hysterically at things people don’t understand. So I’m cautious about the humorous fiction I read, mostly preferring titles that are unexpectedly funny rather than those which claim to be funny. 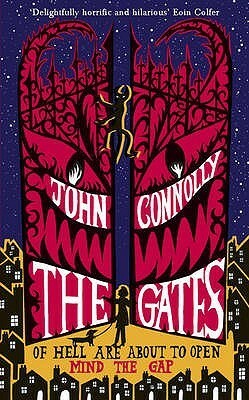 I wasn’t too sure I wanted to read The Gates, particularly after reading a few reviews claiming it was laugh-out-loud funny, but I’ve heard many good things about the author, so I thought I’d give it a try. This story takes place in a small town in England. 11-year-old Samuel Johnson and his dachshund, Boswell, witness their neighbors summoning strange beings though a small, glowing hole in their basement. Meanwhile, two scientists in Switzerland in the middle of a Battleship game are bewildered by a rotten egg smell and a bit of energy that escaped from a particle accelerator. Together, these events have freed all kinds of nasty beings intent on destroying the world. It is up to Samuel to stop them, that’s if anyone would believe him. The physics stuff in the beginning slowed me down a little, but I thoroughly enjoyed the quirky characters, the nasty demons, and the banished demon, Nurd, who becomes Samuel’s unlikely ally. I loved the fantasy and horror elements, the lighthearted humor, and the enlightening footnotes. This is a fun story that I’d recommend to young and old alike. Would you live your current life over again?